The swim at IM Mar del Plata was shortened to 1.9k (or 1.2 miles, possibly even a bit shorter) due to low temperatures. Obviously, this makes this years results ineligible for course records and comparing the results a bit tricky. Even though the fastest athletes were quicker than last year’s athletes (and new course records would have been set), it seems that the bike and the run were a bit slower than last year. Kona QualifyingWith 23 men and 15 women starting the race, I initially thought that there would be even Kona slots. But apparently the two “base slots” each for the men and women played a role, and Ironman announced that there would be four slots for the men and two for the women.For the men, Michael Weiss and Jesper Svensson had secured Kona slots in earlier races, and the slots rolled down to sixth place. Matt Hanson, Mario de Elias, Lukas Kraemer and Stefan Schumacher received the four slots. The two female slots went to Sarah Crowley and Susie Cheetham, while Mirinda Carfrae validated her Kona Champion slot. 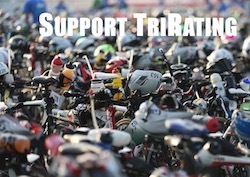 With 23 men and 15 women starting the race, I initially thought that there would be even Kona slots. But apparently the two “base slots” each for the men and women played a role, and Ironman announced that there would be four slots for the men and two for the women. For the men, Michael Weiss and Jesper Svensson had secured Kona slots in earlier races, and the slots rolled down to sixth place. Matt Hanson, Mario de Elias, Lukas Kraemer and Stefan Schumacher received the four slots. The two female slots went to Sarah Crowley and Susie Cheetham, while Mirinda Carfrae validated her Kona Champion slot. Is Stefan Schumacher the former doper from cycling who is now qualified for Kona? Unfortunately, he’s the same guy. He was tested positive twice in 2008 for CERA and served a two-year suspension that was reduced by a few months (https://en.wikipedia.org/wiki/Stefan_Schumacher).